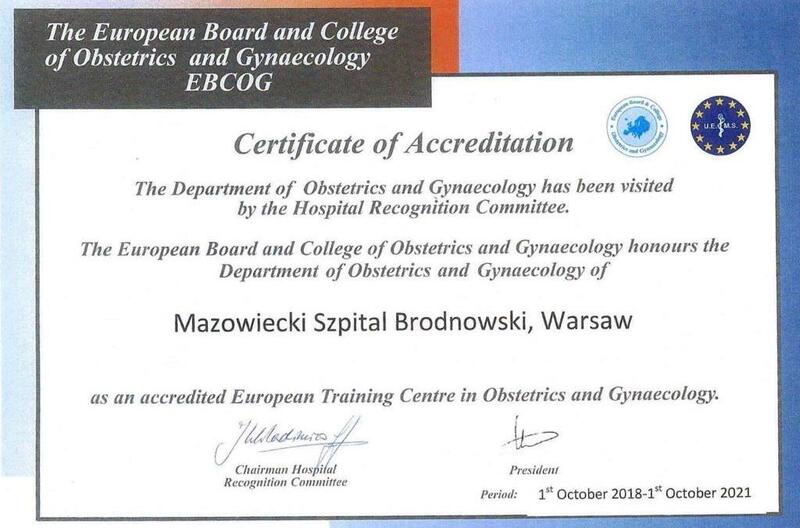 Medical University of Warsaw’s Obstetrics, Women's Diseases and Gynecologic Oncology Chair and Clinic headed by prof. Włodzimierz Sawicki obtained European Board and College Obstetrics and Gynecology (EBCOG) accreditation. EBCOG accreditation ensures that the University’s Clinic meets the highest possible European postgraduate training and health care in obstetrics and gynecology. Physicians that decide to do their postgraduate training at our Clinic are guaranteed the highest standards of training based on a harmonized curriculum in obstetrics and gynecology developed and defined by EBCOG. EBCOG visited Medical University of Warsaw’s Obstetrics, Women's Diseases and Gynecologic Oncology Chair and Clinic in April, 2018. EBCOG’s Visiting team included prof. Juriy Wladimiroff, Chairman of Standard Committee Training Recognition (SCTR) from the Netherlands, dr. Zbigniew Węgrzyn from the Medical Center of Postgraduate Education as well as prof. Wojciech Rokita and prof. Piotr Laudański from the Polish Society of Gynecologists and Obstetrics. To be accredited by EBCOG, teaching hospitals must successfully pass a quality assessment of their departmental infrastructure, training program and facilities, as well as, working relationship with university departments. Only 6 clinics in Poland have EBCOG accreditation. Visit https://www.ebcog.org/ for more information about the European Board and College of Obstetrics and Gynecology.